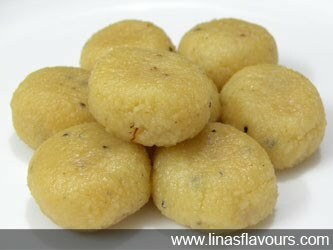 Milk Penda (Milk Fudge Balls) is one of the most popular sweet dishes enjoyed anytime of the year. Take a thick bottom pan and heat milk. Stir it continuously to avoid lumps. Add sugar and khoya after 15 minutes. Stir it continuously till it starts thickening. It will start sticking at the bottom and sides so you need to stir it continuously. Add cardamom powder and saffron. Cook it for 5 minutes more. Switch off the gas stove. Let it cool slightly. Make small balls and slightly flatten it. Store it in the air tight container. You can store it for 5-6 days. You can add pistachio also.